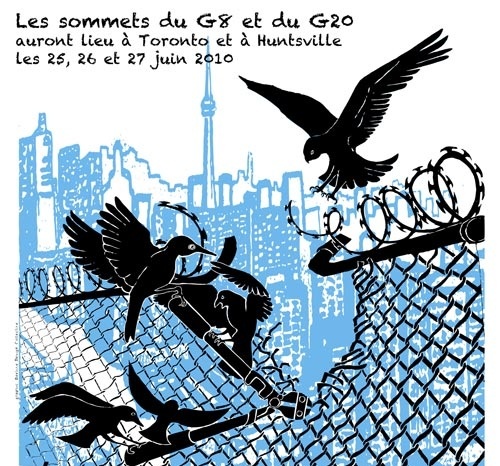 June 27 (pm) - The Saturday Night Feaver event, which was going to be a vibrant party, was cancelled since the detained organizers had the keys to the equipment. A solidarity dance was called in front of the detention centre, where about 200 anti-riot police encircled about 120 youth. The police swore, before the media, that they would not be arrested if they left peacefully. About 90 left quickly, almost ran, but 30 were arrested 150 feet away when leaving peacefully on the sidewalk. Hence 200 anti-riot police now encircled 30 youth, of which 2 were legal observers. * police officers raided a Toronto home. They entered the house without consent through the back door, aggressively dragging unclothed people from their beds, kicking others who were asleep on the floor. * "I requested a warrant at least five times..."
allow those in the house to call for legal advice. * A policeman "grabbed my phone away from me and smashed it onto the front porch”. A press conference, about this political repression, was to occur Saturday morning in the Allen Garden. The police "preventively" arrested those who were to speak. No One is Illegal spokesperson Syed Hussan was arrested today on the way to a press conference addressing the targeting of community organizers. Farrah Miranda, who was with Hussan at the time on the way to the press conference, was detained in an unmarked van and driven around for 45 minutes in what she calls “a clear attempt to intimidate me”. Plainclothes officers refuse to provide badge numbers. The press conference was outside the house of two people who were arrested early this morning and was addressing the targeting of community organizers.